As we work on forcing the dust to settle more than it seems to want, while waiting for a big batch of images to arrive, but before it gets too far behind, a shout out and appreciation to all for making the 2018 Young Tradition Weekend the best yet…….. performers, volunteers, crew, zoo keepers, families, contestants, sponsors, co-producers, hosts, guests, planners, vendors, guests, agents…… and especially whoever takes responsibility for delivering on Saturday the most beautiful day of the year, so far. And major appreciation to manager Yasi Zeichner for working on putting the weekend (months!) together since last fall. It sure is starting to feel like a festival, isn’t it? :)) We’ll see where that goes in 2019. For now, a well done, to everyone! Our focus as an organization is young people involved with traditional music and dance. But if we can accept that tradition is a thread that is hundreds, even thousands of years old, surely the lifespan of any of us around today pales in the grand scheme of things. Some, like Margaret MacArthur, and many of the family and friends gathered for the Sunday tribute concert and the entire weekend, plow a deeper row than most. Over the weekend, as we celebrated and recognized young folks involved with trad music and dance, and those we paid tribute to, everyone lives on in the songs that are sung, the tunes that are played, the dances that are done, the memories that are shared, the way we chose to carry ourselves, and the way we pass what’s important on to the next generation and the next person in line. 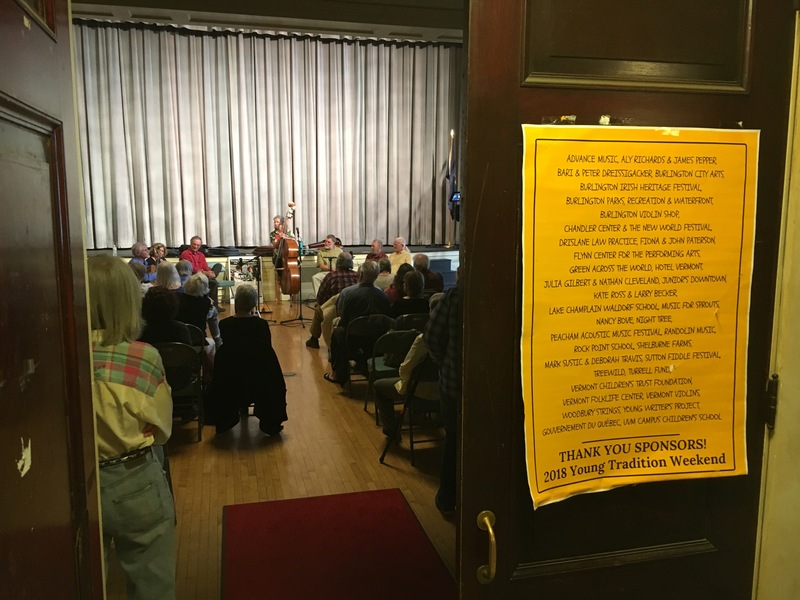 Summary notes from Weekend Manager Yasi Zeichner…..
Young Tradition Weekend 2018 was a great success, once again – thanks to everyone involved in bringing it all together: performers, collaborators, sponsors, and volunteers! In the couple weeks before the event, we were busy finalizing performer lists, chosing finalists for the contest, creating and printing programs and voter ballots, recruiting volunteers, and tying off any loose ends in our plans. We then kicked off YT Weekend with a radio appearance by Mark Sustic and Yasi Zeichner on Big Heavy World, featuring some live fiddle tunes, and examples of contest submissions. The community dinner and contra dance at Burlington High School was well attended, and we had a turnout of 25 or so students from the Fiddle Tunes Clubs playing music for the dance! Fortunately, we had sunny weather for the contest finals at Waterfront Park Kid’s Day – we had a great audience (both families of contestants and passers-by) and all the contestants had obviously worked hard on their acts and all put their best foot forward with their performances. Congratulations to first place winners Romy and Ben Munkres, second place Alexander Allison and Sebastiaan West, and third place Samuel Foucher and Perin Ellsworth-Heller! The showcase concert – always one of the most popular parts of the weekend – featured a fabulous range of music and dance, from Irish polkas and reels, to Balkan traditional songs, to Nepali dance, and more. Finishing off the weekend, the Margaret MacArthur tribute concert seemed like a magical gathering of friends and family, and a wonderful, heartfelt sharing of the music that Margaret sang and loved. The reception after the concert (the first time we’ve had one) was a great success as well! Now we are already thinking about next year’s event – planing on how to build on this year’s successes, and having some new ideas percolating as well. We welcome any comments and feedback from folks involved in making this happen!